by Adele Uphaus Thank you, Adele, for this generous contribution to LizzieSiddal.com. Alice Jardine’s influential book Gynesis: Configurations of Women and Modernity describes Jardine’s theory of the process through which a woman is created by patriarchy, by history or by the culture she inhabits. Rather than focusing on representations of women in literature or literature written by women, she states in the introduction to her book that she is “concerned about the process of (reading and writing) woman” (Jardine 19). In other words, she examines the transformation of the feminine from subject into verb, an operation that renders her liminal and ephemeral and puts her and her obligatory, that is, historical connotations “to use as intrinsic to new and necessary modes of thinking, writing and speaking” (Jardine 25). Gynesis is the term Jardine coins to describe this undertaking. By definition, such a scheme must have the effect of stripping women of their own agency. As results of a process, they cannot be subjects, only objects, and as such they cannot create but can only facilitate creation. If a woman does attempt to create, as Nancy K. Miller states in Arachnologies: The Woman, the Text and the Critic, patriarchy will view her product as separate from her and will deny her authority over her own production. Miller uses the story of Arachne, the skilled weaver who attempts to claim equality with the goddess Athena to explain her theory. Everyone assumes that Arachne must have been taught by Athena because her work is so beautiful that it cannot possibly have sprung from her own human creativity. Athena “ a goddess who is nevertheless aligned more closely with patriarchy because she was not born of a woman but sprung fully grown directly from the head of Zeus“ punishes Arachne by turning her into a spider who weaves because it has to, not because it chooses to. This is the “effacement of the spider, the masculine recuperation of the feminine, and it is variant of the phenomenon Alice Jardine has named gynesis, Miller writes (Miller 271). Miller’s essay stresses the necessity of what she calls “overreading” a woman-authored text. Overreading involves reading women’s writing as if it had never been read, as if for the first time. To overread is also to wonder, as Woolf puts it famously in A Room of One’s Own, about the conditions for the production of literature (Miller 275). but her work has mainly been viewed as a reflection of the work of her male counterparts, not as a product of her own initiative. When we apply the theories of Jardine and Miller to the life of Lizzie Siddal, the extent to which her husband and the other Pre-Raphaelites, and hence history, created her and at the same time denied her the agency and authority to be a creator becomes clear. Both Miller and Jardine’s essays set up a framework that can be applied to various works of art in order gain new insight into representations of women. Both present us with theory or way of reading and hint at what the application of the theory might look like, leaving room for others to do this work. Jardine reveals that there is a process of gynesis which invokes femininity to enable new and necessary modes of thinking, but what she does not discuss is how the woman conjured up by this process can actively respond to it. 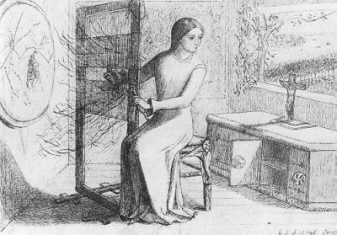 However, if we put Miller and her theory of arachnologies in a dialogue with Jardine, especially over the figure of Lizzie Siddal, a form of female response emerges. By “overreading” Lizzie’s painting and poetry, it becomes clear that through her roles as both muse and creator, she exemplifies both gynesis at work and a woman’s reaction to her own gynesis. She and her art exist as a result of the modern and revolutionary goals of the Pre-Raphaelites and as a living critique of the movement that invoked her image. The Pre-Raphaelite Brotherhood was a group of idealistic artists who were united in rebellion against the current trends in art, as they were exemplified by the Royal Academy and its influential president, Sir Joshua Reynolds. The three core members Dante Gabriel Rossetti, John Everett Millais and William Holman Hunt met as students at the Royal Academy and formed the Brotherhood in 1848 in order to officially express their ideals. Formed as it was in the year of several notable European revolutions, the Brotherhood “drew its impetus from vaguely revolutionary sentiments,” as David Riede writes, and was framed by Rossetti in particular as “calculated and daring revolt against the authority of his elders” (Riede 44-45). The young men felt that the freshness, purity, and truthfulness of Renaissance art had been stymied by the conventionalities of Reynolds, and they wanted to liberate contemporary art by attempting to bring back some of the techniques they felt contributed to the brilliance of the work of Raphael and his contemporaries. Francine Prose describes these techniques as “simplicity, clarity, [and] the direct, accurate representation of nature” (Prose 105). However, while the Pre-Raphaelite Brotherhood found inspiration in the art of the past, it was by no means a backward-looking movement. Rather, it projected forward into the future, and was actually thoroughly modern, even avant-garde, as Riede suggests. The Pre-Raphaelite paintings, with their brilliant colors, lack of perspective and flat, decorative appearance, were immediately identified by the influential Victorian critic and theorist Walter Pater as belonging to the aesthetic movement, which promoted the ideals of “art for art’s sake. The Pre-Raphaelite’s work was art about art, and was therefore acutely aware of itself as art. The self-referentiality and near-hyperrealism of their paintings are clear forerunners of the same tendencies in postmodern art and literature. The artists favored medieval and literary themes from Britain’s past, stories from Dante’s Vita Nuova, Shakespeare, and Arthurian legend, but they also drew from the literature of their Victorian contemporaries, Keats and Tennyson in particular. 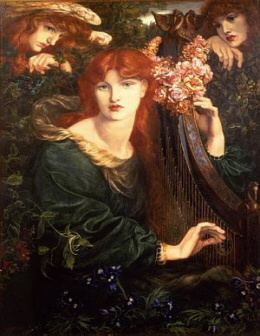 Thus, with their new ideas about painting that were inspired by pre-Renaissance art and their use of both medieval and contemporary Victorian subject matter, Rossetti and his friends were, as Pamela Todd writes, “paradoxically both modern and medieval, romantic yet seeking scientific realism” (Todd 19-20). 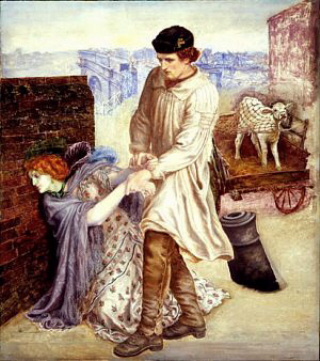 Todd goes on to say that “the movement had an explosive impact on English nineteenth-century art and its influence endures still.” One method the Pre-Raphaelites employed to achieve the naturalism and accuracy they sought was to use each other as models and working class women they found on the streets, whom they called “stunners”, as female counterparts. Prose quotes William Michael Rossetti, whose diary describes his brother “parading Tottenham Court Road, together with Hunt and Millais, on the search for models” (qtd. in Prose 105). Elizabeth (Lizzie) Siddal, a 20-year-old milliner’s assistant who was “discovered” by the painter Walter Deverell in 1849, was their first find. of thinking, writing and speaking” (Jardine 25) perfectly captures the way Lizzie’s image was conceived and used by these painters. of devotion. McGann notes one of the artist’s diary entries, in which he recorded his desire to paint a scene of Venus, the goddess of beauty, surrounded by mirrors reflecting differing perspectives of her (McGann 106). This idea was never actualized, but it represents Rossetti’s hope to deliver to the world a painting the subject of which would be no less than Beauty and art itself. What McGann finds interesting about this goal is the idea of the mirrors depicting various perspectives of Beauty (McGann 106). Such a picture would show the various fragments that make up the whole of an ideal and therefore has a lot in common with the project of the Modernists. His rather complex personal and artistic relations with Siddal reflect both his desire to live an unconventional, more or less bohemian life and, more significantly, his attempt to see all things in the terms of his art. What might be called his shaping vision as an artist took the form of producing a personal vision of her in art and, Pygmalion-like, of transforming the subject of his art into his lover, and finally into a reflection of himself as an artist. (Riede 52). Thus, Rossetti’s portraits of Lizzie record his search for a way to represent “soul’s beauty” and his hundreds of re-workings of her image can be seen as a form of his modernist idea of reflecting the myriad perspectives of this concept. His singular fascination with her was symptomatic of his dangerous tendency to “conflate the Shelleyan ideal of the soul within the soul with visionary beauty but also with death, which lent a kind of tragic luster to the visionary quest, a kind of morbid attraction” (Riede 2). 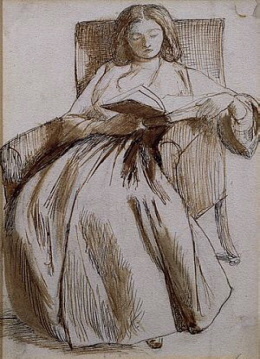 It is clear that Lizzie’s image was invoked as part of Rossetti’s modern mode of thinking according to Jardine’s theory of gynesis. An examination of Rossetti’s portraits and of first of John Everett Millais’s Ophelia, can show in greater detail how the ideal of Lizzie Siddal was created. Millais’s haunting painting (Image 1 ), perhaps the best-known painting for which Lizzie modeled, portrays the half-dead Ophelia floating down a river with flowers in her hands, supported by her flowing full skirts. Millais took quite seriously the Pre-Raphaelite’s aim of painting with truth to nature, which was one of the central ways their art took a step forward from that of their contemporaries (Riede 6). The artist spent many hours meticulously drawing studies of foliage along the Thames River, and to accurately capture the water-logged effect of Ophelia’s drowning body, he had Lizzie pose lying in a bathtub full of water, which was warmed by oil lamps placed under the tub. Gay Daly, in her book on famous Pre-Raphaelite couples, tells of how the lamps went out without Millais noticing and of how Lizzie remained in position in the freezing water for five hours without saying a word, falling severely ill as a result (Daly 41). As Daly writes: “The image [of Ophelia] is one of utter passivity. One wonders whether Millais chose Lizzie for his model because he saw in her the capacity for such complete surrender”(41). The resulting painting clearly exemplifies what Audrey Williamson has described as the “new brilliancy and clarity of the Pre-Raphaelites to which modern painting still owes a debt” (Williamson 64). 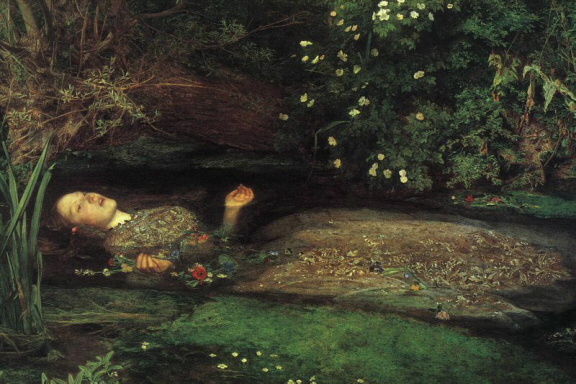 A central part of the formula that makes the painting so modern is Millais’s direct rendering of Lizzie’s ill features, which seem to perfectly match our collective mental image of the dying Ophelia. Thus, he uses Lizzie as part of his modern artistic project and at the same time cements an image of her as perennially sickly and passive. admiration of sickly, delicate women. 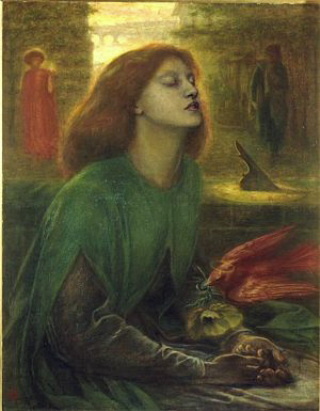 Rossetti also frequently painted Lizzie as Beatrice , the life-long love obsession of the medieval poet Dante Aligheri, with whom, as Francine Prose writes, Rossetti closely associated himself (he was born Gabriel Charles Dante Rossetti, but chose to make “Dante” more prominent when he became an adult). According to Prose, “Much about [Rossetti’s] romance with Lizzie suggests that [he] essentially, if unconsciously, shopped around for a woman to match (and on whom he could act out) his fantasies about Beatrice” (Prose 104). 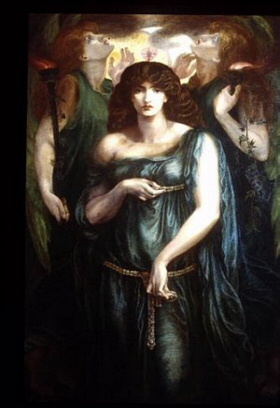 By painting Lizzie the way he did, Rossetti connected her with the ideal of a distant, unavailable love-object that Dante’s worship of Beatrice from afar represents. Prose writes that Rossetti even “seemed to prefer the idea of Dante’s muse, dead for five hundred years, to the actuality of his own model, mistress, muse, and wife” (Prose 103). Rossetti continued to associate Lizzie with the 13th-century Beatrice even after her death in 1862 (only two years after they finally married) from an overdose of laudanum. In Beata Beatrix , one of his most famous paintings, he puts the finishing touches on the image he created of his wife as a passive, remote, tragic object of worship. 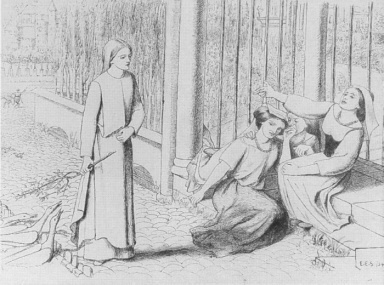 Beata Beatrix purports to depict the moment of Beatrice’s death when she is suddenly transported to heaven, but upon close inspection it seems to be more about Lizzie. Once again, she is portrayed as completely passive, partly-dead, with her eyes closed and mouth half-opened, seemingly possessed by a trance. A dove, the symbol of peace, drops a flower into her palm, but somewhat ominously, the dove is painted a lurid red, and it does not bring her a lily or an olive branch but a crimson poppy, a reference to the opiate that killed Lizzie. 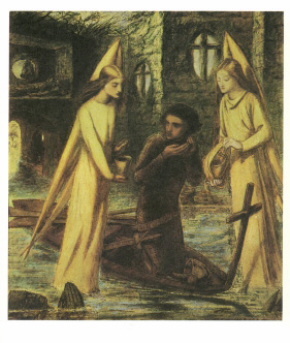 This painting preserves the image of Lizzie Siddal that Rossetti created, with all its remoteness and aura of tragedy. 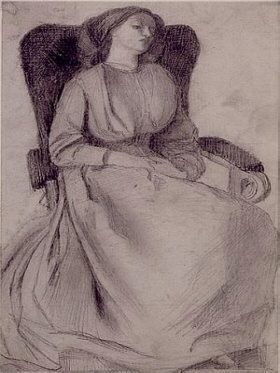 Interestingly, one of Lizzie’s close friends, Bessie Parkes, said later that she could not even recognize her friend in the painting: “I feel puzzled by the manner in which the artist took the head and features of a remarkably retiring English girl and transfused them with an expression in which I could recognize nothing of the moral nature of Miss Siddal” (qtd. in Prose 107). The quote serves to show the extent to which Rossetti ignored the personality of the real Lizzie and created a role for her to play that served his own modern artistic project. Rossetti did not attribute passivity to all his female subjects. In contrast, most of them are endowed with a strong sense of presence and agency. While, as Francine Prose writes, Lizzie was almost exclusively portrayed in a state of moribund repose or actually dead, all the rest of Rossetti’s women look very different: Their bodies, their faces, and most of all their hair look terrifyingly alive (Prose 124). In paintings such as La Ghirlandata, Astarte Syriaca, Monna Vanna, and Regina Cordium ( ), the women are depicted full-scale in vibrant colors. They are often painted close-up and they fill the bulk of the canvas. With full, sinuous necks and active, contorted hands, they recall the large-than-life goddesses and sibyls of Michelangelo’s Sistine Chapel ceiling. Perhaps the most important difference between these paintings and the representations of Lizzie is the fact that these women confront the viewer and make direct eye-contact. In the one small self-portrait Lizzie produced ( ), she gives herself the agency this type of eye-contact connotes. In contrast to Rossetti’s hazy, idealized pictures, she renders herself in crisp, almost sharp detail. Her face fills the small canvas and she looks out at the viewer. Her eyes are not charmingly demure, but rather world-weary. She is a flesh-and-blood 19th-century woman, not a distant and passive idol from myth and legend. However, the image we associate with Lizzie Siddal is not this one, but the one created by Dante Rossetti and his fellow artists. 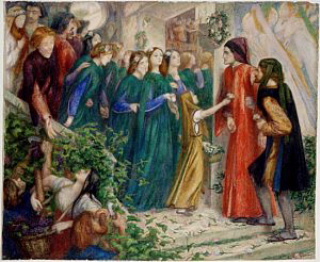 From this and the examples described above, we can see the extent to which the Pre-Raphaelites found inspiration in the ideal of a tragically ill and passive woman, how they ascribed these characteristics to Lizzie, and how they put her image to use, producing works that met the goals of their revolutionary artistic project. 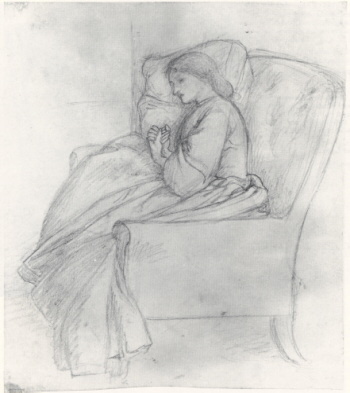 The work that Rossetti, Millais and others did with Lizzie in this respect exemplifies Alice Jardine’s theory of gynesis. 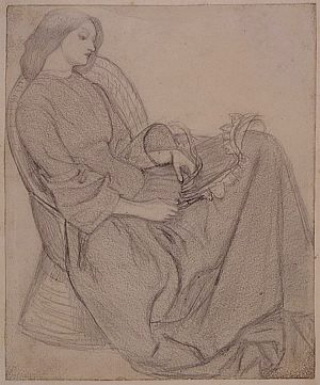 Another way in which Rossetti and other Pre-Raphaelites created the image of Lizzie Siddal is through their diary entries, letters to each other, and other writings. Dante’s brother William was the chief biographer of the movement. As Lucinda Hawksley writes, William wrote, or at least edited, most of the contemporary accounts of Lizzie, and his view of her was far from objective. Hawksley theorizes that, as a younger brother who idolized his older brother, he may have been quite jealous of Lizzie for captivating Dante so completely and monopolizing his time (Hawksley 57). In any case, his recorded impression of her is not favorable. His writings describe Lizzie as aloof and disagreeable, just as his brother depicted her in his drawings as remote and withdrawn. Her character was somewhat singular “ not quite easy to understand, and not at all on the surface. All her talk was of a “chaffy” kind its tone sarcastic, its substance lightsome,” he writes (qtd. in Hawksley 57-58). This description suggests that Lizzie may not have fit the mold of the “typical” Victorian woman, and, being baffled by her, William Rossetti characterized her as difficult and haughty. Similarly, what Dante Rossetti chooses to write about Lizzie in his own letters is in keeping with his artistic representations of his model/muse. Hawksley writes that he called her his “meek unconscious dove,” and frequently drew a picture of a dove instead of writing her name” (Hawksley 52). More often than not, what he writes about her in his letters has to do almost exclusively with reports about her health. We can see this in the following quotes from William Fredeman’s collection of his correspondence from 1855-1862: sometimes he writes that Lizzie is “rather better”; then he is anxious about her because he believes she doesn’t eat enough; then her health will not bear [any] excitement and he is most wretched about her; then he writes dismally of the “failing state of her health” and says she is in a “broken state; there might then be a slight rally”, but in the next letter he is once again “in the most agonizing anxiety about poor dear Lizzie’s health, is sorry [he] cannot give any good news of her health, but we must hope for the best” and says he “need not say what an anxious & disturbed life mine is while she remains in this state”. Perhaps the most positive thing he says about her is that she is “pretty well for her”. While there is no doubt that Lizzie did have health problems which stemmed from a dependency on laudanum, a doctor who examined her in 1855 found that Rossetti’s “apprehensions concerning her health were greater than her condition called for” (qtd. in Fredeman 42). From his letters, we get the impression that their life together consisted solely of Rossetti nursing Lizzie at her bedside. His insistence on depicting her to everyone as a constant invalid rather than describing her in any other capacity adds to the withdrawn, tragic picture he created of her through his drawings, and once again renders her passive. Lizzie’s own letters underscore the tension between her true personality and the one Rossetti’s words cause us to attribute to her. Taylor goes on to describe the reaction of several critics to an exhibition of Pre-Raphaelite works at the Royal Academy in 1973. Of Lizzie and her art, the critics wrote quite harshly, calling her personality vague and pathetic and declaring that she had “no original creative power” (qtd. in Taylor 29). 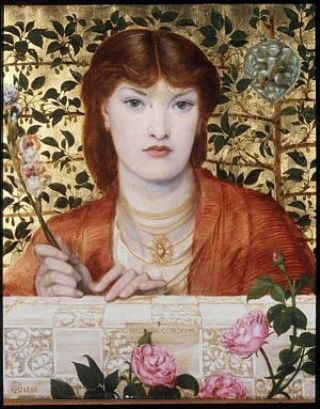 Her art, they wrote, was merely a dim reflection of Rossetti’s brilliance. Her work met with similar criticism in its own time; her painting Clerk Saunders ( ) was part of the 1858 American Exhibition of English Art, but when the exhibition moved from New York to Pennsylvania, it was removed, because one of the organizers found it “childish and trifling”(qtd. in Fredeman 228). Dante Rossetti’s brother, William, commented unflatteringly on the “executive shortcomings”of her paintings, and accredited the fact that any of her paintings sold to “acts of generosity” (qtd. in Prose 112). All of these indictments have the effect of denying Lizzie any mature creative impulse of her own, rendering her childlike or doglike in her mimicry of Rossetti, and subject to the kindness of strangers, as Blanche Dubois would say. in love with her [Prose 109-110] seems quite snidely reductive, and her comment only contributes to the tragic/romantic image of Lizzie that was produced by Rossetti and others. In this instance, Prose reads Lizzie as a product of her gender alone; her sexuality is her only tool, she suggests. But not only was Lizzie the only female in the Pre-Raphaelite exhibition during her own time, but she was also the only woman whose work was shown in a more recent exhibition held in 1984 at the Tate Gallery in London (Hawksley 142). 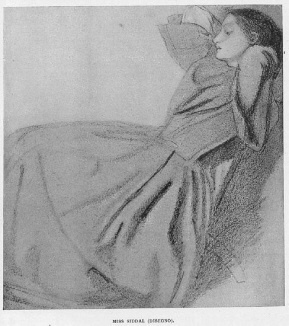 If, as Elaine Showalter suggests in Feminist Criticism in the Wilderness, critics would read for the culture that surrounds and produces a person or a work of art, such as taking into account the difficulty of becoming a successful female artist in the 19th-century, rather than reducing Lizzie’s success to the fact that her work was only admired because she was attractive (an essentializing tactic which has the effect of obliterating agency), they will get a “more complete and satisfying picture” (Showalter 259). mer story was one of the earliest depictions of this soon-to-be hugely popular subject (Taylor 33). 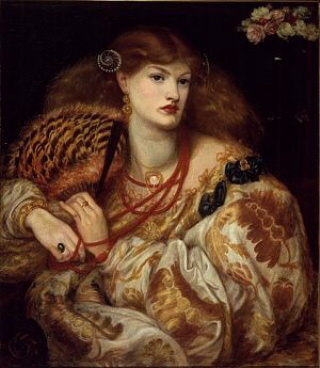 Before he met her, Rossetti had painted almost exclusively religious subjects and in the later half of the 1850s he started producing his large, sensual ¾-length portraits of women, but during the years when his relationship with Lizzie was at its height, the majority of his output had the medieval subject matter that was her great love. In order to return to Lizzie the agency as an artist that has been taken from her, it is necessary to perform the sort of “over-reading” Miller advocates in her essay on arachnologies. Lizzie painted many popular Pre-Raphaelite subjects, but she did so in a way that focused on women as subjects, rather than passive and aloof objects of the male gaze. When her work is studied with Miller’s active, objective eye, instead of as the output of Dante Gabriel Rossetti’s muse, its originality and creativity becomes clear. As Beverley Taylor writes: “Siddal’s work subtly but incisively critiques Victorian gender ideology [her paintings are] aesthetic creations participating in her culture’s ideological debates”. (Taylor 29). It also reveals that Lizzie was aware of and responded to the process, described above, of her own gynesis. Shefer also suggests that the somewhat awkward position of the Lady on her chair expresses the fact that she may be nervous about being a woman artist, as this was not an activity women were encouraged to seriously undertake (Shefer 103). If so, then this picture can be read as Lizzie’s subtle critique of a society that denies women the agency to be creative. Other paintings besides The Lady of Shalott reveal that Lizzie was an inventive artist in her own right, and not just an empty vessel through which Rossetti’s genius could filter, and that her choice of subjects often critiqued rather than confirmed Victorian gender ideology. One such painting is Pippa Passes ( ), based on the poem/play of the same name by Robert Browning. Lizzie chooses to represent the final scene in this play, in which the heroine, Pippa, is enticed to join a group of prostitutes, who have been paid by her uncle to get Pippa out of the way so that her sizeable inheritance will pass to him. Pippa, who as Elaine Shefer points out is a clear self-portrait of Lizzie, passes by the prostitutes, and although they reach out to her, her composed face and straight posture indicate that she has the strength of character to refuse their offer of money and ease. This scene stands in contrast to the popular Pre-Raphaelite subject, represented by Rossetti in Found ( ) of the already-fallen woman being rescued from her miserable state by a man. In Lizzie’s rendering, as Shefer describes, the woman is able to keep herself from this situation by being strong enough to preserve her integrity (105-6). While Lizzie’s own situation more closely paralleled that of the woman in Found than that of Pippa, her choice of drawing this scene may represent her admiration of Pippa’s character and her assurance of the fact that it was possible for a woman to keep herself from being reliant on men. Through these paintings, Lizzie Siddal spins her own web of stories and associations. Miller’s theory of arachnologies allows us to return to her the presiding creative authority over her own work. When her starlike beauty dies. This poem shows that Lizzie was acutely aware of the situation she found herself in, in which her own character and her own personal goals and desires, suggested by her “wild eyes”, were sublimated to serve the artistic project of an idealistic young painter who set out to, and did, completely reform the 19th-century art world. This poem and Lizzie’s paintings represent her own reaction to the process of gynesis which created her. 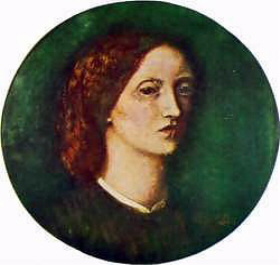 Rossetti’s sister Christina Rossetti was also clearly aware of the process that had “Lizzie Siddal” as a result. Her poem “In an Artist’s Studio” seems to suggest the extent of her understanding of her sister-in-law’s position and how it was ruining her. Here again, we find a woman’s response to the overwhelming forces of gynesis. The mirror gave back all her loveliness. Siddal and other female artists. Putting the theories of Miller and Jardine in a dialogue with each other allows us to recognize the processes that create and write “woman” and shows us how to look beyond these processes in hopes that we might be able to hear her voice. Daly, Gay. Pre-Raphaelites in Love. New York: Ticknor & Fields, 1989. Fredeman, William, ed. The Correspondence of Dante Gabriel Rossetti: The Formative Years, 1985-1862. Vol. 2: 1855-1862. Cambridge, UK: D.S. Brewer, 2002. Hawksley, Lucinda. Lizzie Siddal: Face of the Pre-Raphaelites. New York: Walker & Co., 2004. Jardine, Alice. Preliminaries. Gynesis: Configurations of Women and Modernity. Ithaca: Cornell UP, 1985. McGann, Jerome C., ed. The Complete Writings and Pictures of Dante Gabriel Rossetti. Third installment. Online. Internet. 11 November 2006. <http://www.rossettiarchive.org/>. Miller, Nancy K. Arachnologies: The Woman, the Text, and the Critic. Poetics of Gender. New York: Columbia UP, 1986. Pearce, Lynn. Woman/Image/Text: Readings in Pre-Raphaelite Art and Literature. Toronto & Buffalo: University of Toronto Press, 1991. Prose, Francine. The Lives of the Muses: Nine Women and the Artists They Inspired. New York: HarperCollins, 2002. Riede, David G. Dante Gabriel Rossetti Revisited. New York: Twayne Publishers, 1992. Shefer, Elaine. 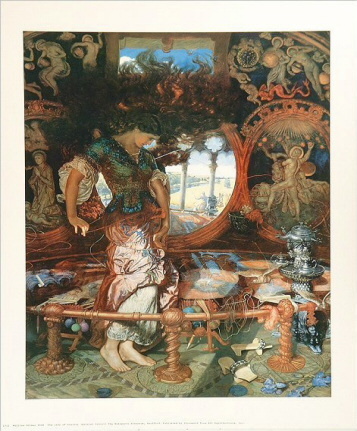 Birds, Cages and Women in Victorian and Pre-Raphaelite Art. American University Studies: Ser. 20, Fine Arts; Vol 12. New York, Bern, Frankfurt & Paris: Peter Lang, 1990. Showalter, Elaine. Feminist Criticism in the Wilderness. New Feminist Criticism. New York: Pantheon, 1985. Taylor, Beverly. Beatrix/Creatrix: Elizabeth Siddal as Muse and Creator. The Journal of Pre-Raphaelite Studies. Vol 4 (Spring 1995): 29-42. Todd, Pamela. Pre-Raphaelites at Home. New York: Watson-Guptill, 2001. Williamson, Audrey. Artists and Writers in Revolt. Philadelphia: The Art Alliance Press, 1976. I have never seen such insight regarding Elizabeth Siddal and her true persona, and I’m not at all surprised that the most quoted biographers in this post are women. It takes one to know one. Thank you Adele Uphaus and Stephanie Pina. Linda, what a beautiful and thoughtful comment! I feel that I don’t deserve to even be included in such praise, since it is Adele’s work and I am so grateful that she offered to include such an insightful essay on this site. And I think you have hit upon something about the female experience. Elizabeth went through such a rocky relationship with Gabriel (and he with her) and was in the depths of addiction, marriage, pregnancy, stillbirth, and then post-partum depression! There’s facets of life that that many women can relate to. And on top of all that, Lizzie was still able to write and paint and draw…and create in an age where women weren’t supposed to do anything, let alone become anything. You see, you have a real feel for her situation; it comes through in your own writing and with the articles you share. In addition to all the trials you mentioned, I also suspect Lizzie constantly dealt with the frustration of being unable to depend on Gabriel, and then to make matters worse (I don’t remember which book on him I was reading, but I remember being left with this distinct impression), if she dared complain about his failure to keep a promise or comittment, he would reproach her in such a way that she was left questioning her own culpability in the matter and, later, her very sanity. In modern psychological terms, this is known as gaslighting–an isidious form of manipulation that leaves the “victim” feeling used and robbed of energy, but in such a subtle way that she can’t quite put her finger on it. And gaslighters are generally quite charming, especially to outsiders, making the gaslightEE begin to wonder if there might really be something wrong with HER. If this was the dynamic between them, it might explain their frequent bickering and what others saw as Lizzie’s “difficult” personality. No doubt she was worn out after years of living with this manipulation, whether or not it actually contributed to her addiction and depression (how could it not?). More and more, mostly through what I have read on your website, I appreciate Lizzie’s fortitude, courage and determination in a life and time that clearly challenged her with each and every effort to be her own person. How wonderfully refreshing to read this article and these insightful comments. 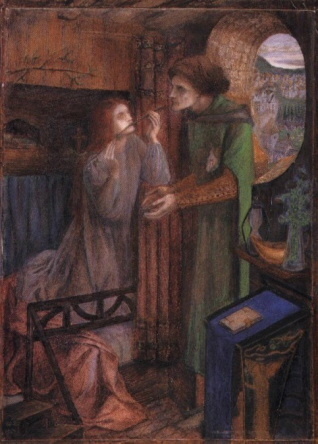 I have long since felt that Lizzie was forced by circumstance and the culture of the time (even among the would-be “bohemianism” of the PRB boys’ club) to adopt the role of “invalid” as a means of survival; especially after being (on the surface) encouraged and supported by Rossetti , John Ruskin and the rest of the boys , but then having her interest in and capacity for “spiritualism” –which I perceive as being a manisfestation of her own spiritual strength and a genuine sense of mysticism — derided (and actually forbidden by Ruskin) and then told to actually cease painting (again by Ruskin). Gaslighting, indeed. There is another modern word for all of this: “crazy-making”. I stayed up way too late tonight reading this fascinating article. Thank you for providing so much well-researched insight into Lizzie Siddal. To anyone interested in this and related topics I can recommend the book ‘Katie’ by Lucinda Hawksely (cited several times in the above article) which I recently had the pleasure of reading. Katie was Charles Dicken’s second eldest daughter, and artist, model for Millais’ ‘The Black Brunswicker’ and a truly fascinating Victorian woman in her own right.